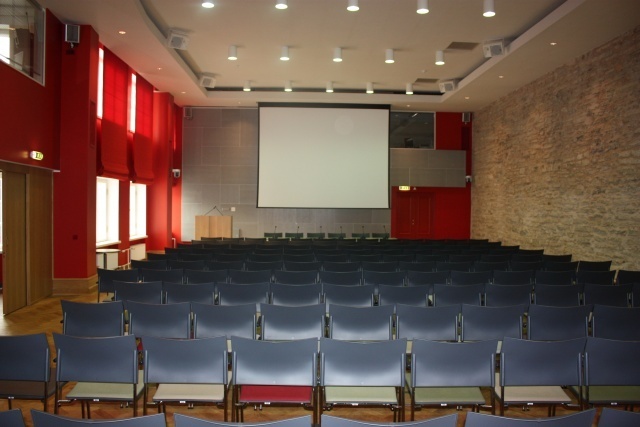 The Conference Hall has good technical facilities and can hold up to 140 people. If you have a cooperation partner in the Riigikogu, you can organise events in the Conference Hall and the Commanders House. Events connected with the work of the Parliament, like open sittings of committees and forums, as well as public discussions on socially important issues, organised by factions, are held in the Conference Hall. At the open sittings of the committees of the Riigikogu, the financing of sports, education reform issues, problems of fisheries, etc. have been discussed. Events on issues topical for the society, originating from the cooperation of the Riigikogu, other national institutions and the third sector, are also often held in the Conference Hall. 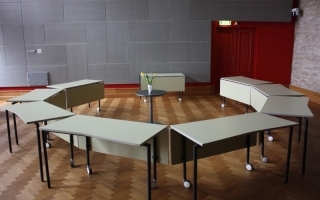 Besides that, parliamentary conferences and seminars take place here. The excellent technical facilities of the Conference Hall have enabled to hold the open sittings of the Riigikogu committees, delegations and associations. In this way, all who are interested can follow the open sittings of the committees, delegations and associations like the plenary sittings of the Riigikogu. Several all-European conferences and seminars organised by the European Union institutions have been held in the Conference Hall. 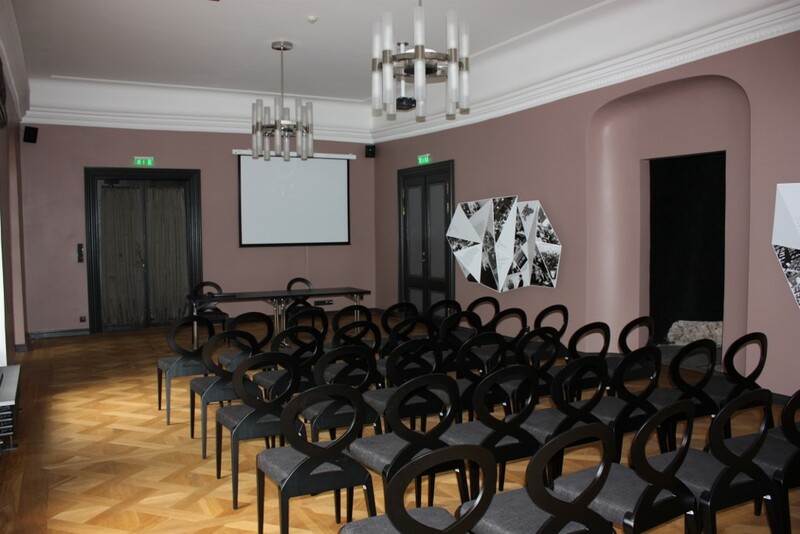 For example, in 2013 the ECPRD (The European Centre for Parliamentary Research and Documentation) conference on the practices for developing of strategies in the parliaments of the European Union took place here. 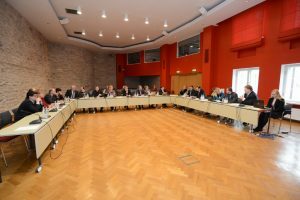 In the same year, the two-day meeting of the Parliamentary Assembly of the Council of Europe on the monitoring of future member states was held in the Conference Hall. 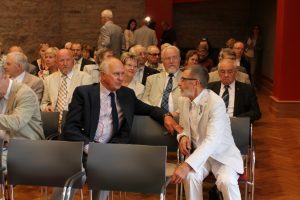 The Club of Venice has also had a meeting in the Conference Hall. Of distinguished guests, President of the European Council Herman Van Rompuy has made a speech here. 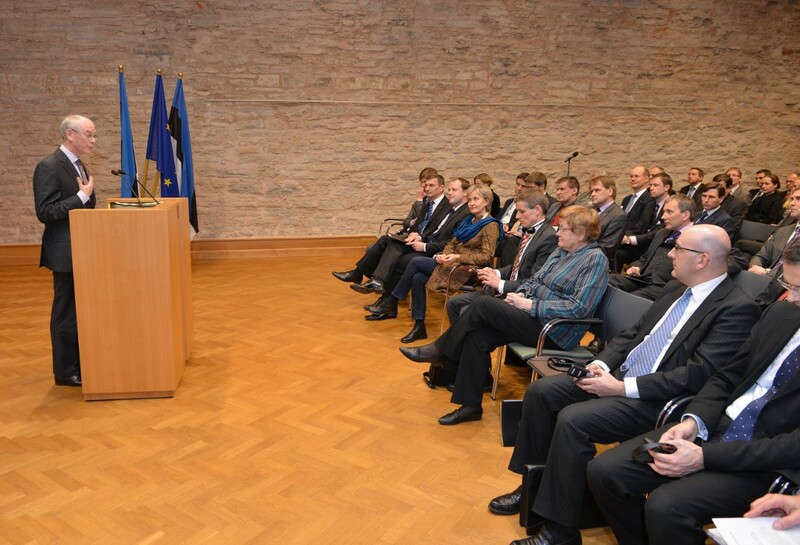 Many events that are important to the state of Estonia have been celebrated in the Conference Hall. 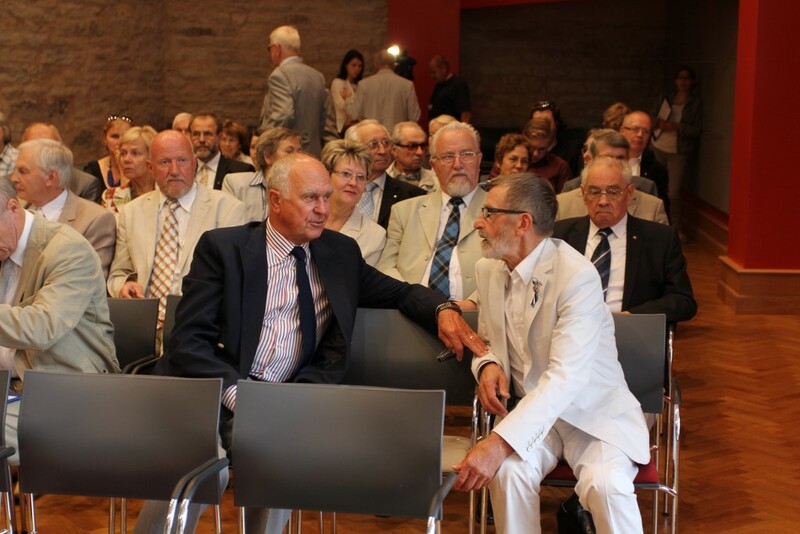 The August 20th Club, who passed the decision on restoring the independence of Estonia, the Club of the members of the Constitutional Assembly and MTÜ Eesti Vabaduse Eest (NGO “For Freedom of Estonia” have held rtheir meetings here. Traditionally, the awarding of the title of the Farmer of the Year, in which the President of the Republic also takes part, is held in the Conference Hall. Book presentations also take place here (e.g. “Helisevad hetked. Suure-Jaani muusikafestivali 15 aastat“, “Margaret Thatcher. Speeches and Interviews”). 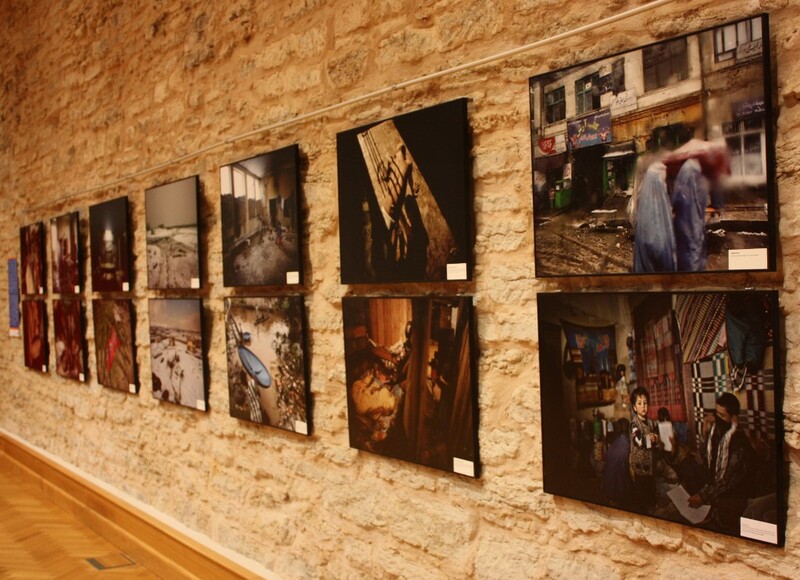 Exhibitions of photos and paintings have also been shown in the Conference Hall. If you have a cooperation partner in the Riigikogu, you can also organise events in the Conference Hall. The Conference Hall and the hall of the Commander’s house are administered by the Facilities Department of the Chancellery of the Riigikogu. If you wish to organise an event, please contact Helin Noor (e-mail helin.noor@riigikogu.ee, phone +3726 316 537). In your e-mail, please indicate the name of the event and the programme, the date and your cooperation partner in the Riigikogu. The Secretary General of the Riigikogu Peep Jahilo authorises the using of the halls. If you wish to organise an event, please contact Helin Noor (e-mail helin.noor@riigikogu.ee, phone +372 631 6537). In your e-mail, please indicate the name of the event and the programme, the date and your cooperation partner in the Riigikogu. … that several eminent people, like the President of the Republic of Estonia Toomas Hendrik Ilves and President of the European Council Herman Van Rompuy, have spoken in the Conference Hall of the Riigikogu?